The novel 8-channel system detects a diverse range of biomolecules from small molecules to proteins to mammalian cells. The new Octet RED96e offers an advanced fluidics-free approach reducing assay run time and minimizing maintenance efforts and cost. The system utilizes Bio-Layer Interferometry (BLI) technology, enabling direct detection of specific proteins and other biomolecules – even in complex mixtures like cell culture supernatants and lysates. Analysis can be done using a single channel or up to eight channels, enabling more flexibility in sample throughput as needed. The temperature of a 96-well sample plate can be controlled from 15‑40°C, allowing reliable measurements at physiological temperatures or low temperatures for sensitive proteins. An optional evaporation cover minimizes losses in sample volume, allowing full post-analysis sample recovery even after a 12 hour run. New software released with the Octet RED96e system also brings enhanced custom reporting options and multi-experiment analysis. Monitor binding events in real time to calculate on-rates (ka), off-rates (kd), and dissociation constants (KD). 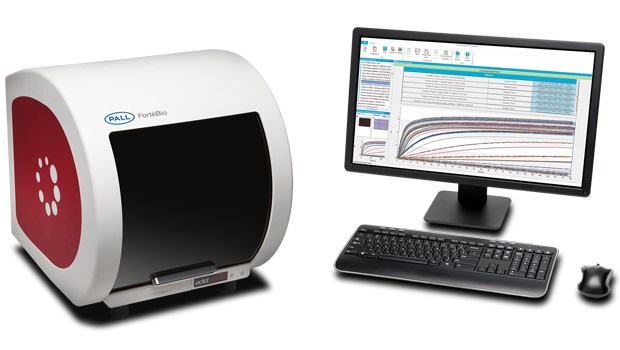 The superior sensitivity of the system enables measurement of small organic molecules and kinetic constants over a broad range. Directly measures the presence of specific proteins and other molecules in solution with minimal interference from complex matrices. Accurate and reproducible concentrations can be determined in as little as two minutes per sample. and be up to daste everyday.